Before he could say anything else, I told Dr. Kimmons that there was NO way I was going to lose my sweet Willow. I would throw myself over her body before I let that needle come near. He understood and told me about the surgeons at Rood & Riddle Equine Hospital in Lexington. He said they are the best in the world, and that if anyone could fix her leg, it would be them. Lexington??? That's too far!!! Isn't there any hospital closer? I won't be able to go with her... my kids.. I can't leave my kids. "For this," he explained, "they are your best hope." Martha agreed, and I trust Martha so much. So Dr. Kimmons emailed them photos of her x-rays and waited for their return call. I heard him answering the surgeon's questions... the last answer was, "No, she isn't a show or dressage horse... No, she's a rescue and a pet... but her owner sure does love her a whole lot." He hung up and told me that the surgeon agreed to take her. Dr. Kimmons gave Willow a shot of bute and a shot of some other pain killer, and then he gave me a hug. So as Martha and Michael prepared the trailer and all her medicines, special food, etc., I stayed with Willow in her stall. She kept looking like she wanted to lay down... her back legs were so unstable.. looking like they would buckle at any moment. Don't lay down, Willow, I begged... I was so worried she would lay down and we'd never get her up. I put her warmest blanket on her and I held her bowl of grain up high so she could eat it. By the time she finished eating, my fingers were frozen, but I found warmth under her mane. And I put three tiny braids in her mane... hoping that somehow the nurses in the hospital would see them and know how much she is loved. As I hugged her, I prayed... and I promised her that she would be okay. But I couldn't help but worry that she wouldn't make the trailer ride... what if she fell because she was so weak and unstable and broke her leg worse... or in a place that couldn't be operated on? What if she broke another leg? What if the surgery doesn't work? What if this is our very last hug? Oh Shana. I cried when I read your status. And I cry as I read this. I pray the vets will be able to heal Willow. Sending lots of love. ^^You must live your life perfectly, making no errors in judgement. Ever. And how wonderful it must be to be able to predict the future! Bravo for you!! And a perfect person such as yourself always needs to point out the obvious, don't you? I sincerely hope you don't have children, those poor kids will never be able to live up to your perfection. ^^ This is intended for Anonymous. My prayers are with you and sweet willow. I am in tears. God has his hand around Willow and you. Hugs sweet Shana, I hope you feel his confort. I've followed your journey from your love affair with the neighbors older gelding and my heart breaks right alongside yours. Willow is so blessed to have been welcomed in to your family with loving, open arms. The unconditional love you've shown her will give her a reason to hold on and a reason to fight. You're in my prayers for comfort, and sweet Willow is in my prayers for a full recovery. Rood & Riddle is an amazing hospital - she will be in great hands. My sister's barrel racing horse recently lost her eye and was so sick and now she is back to running barrels, one eye and all...horses are pretty resilient :-) Prayers for Willow, and for you. I am so sorry but glad that you have her going to the best place for her recovery. I have been following your story with Willow and I feel heartbroken for both of you. Willow has such soulful eyes and why she has to go through so much is just a mystery. But I never read about anyone who loves their horse more than you do. And the beautiful thing is that Willow know this. Lots of prayers for her and you. I don't have an account so the only way to post this is with an anonymous profile - but good thoughts coming from AZ. Shana....I could barely read this blog update through my tears. I can't imagine your tears right now. Words seem to be so empty during times like these.....but please know that I am praying to God and thinking of you tonight and praying for wisdom and skill for the doctors and God's favor to be upon dear Willow. I will be waiting through the night for updates. Please let us know when you hear from Martha as to how Willow is doing. Thank you. What a wonderful person she is to help you as she is doing. Im sitting here with tears streaming down my face. I am so sorry. I am praying for your sweet willow. I pray that they can fix her leg and she can return home. Shana- I have been following your blogs since you brought Sophie home. When I read this post I was brought to tears. Please know I am praying hard for you both. I have been quietly following your blog since you first found Willow. All of her struggles have been so heartbreaking, but she is strong. She is determined! She has come from a place of being alone and sick, to knowing a true and amazing love!! You are so lucky to have found each other. I am certain that your story with Willow is not over. I will keep praying for her and your family. Shana, I've been following your story and am praying for you! Please keep us updated, praying for healing of your sweet Willow and your broken heart. I pray and for you, Please let her be okay Please! I don't know you but I feel like I do from reading your blog and following you on FaceBook. I believe you are a good person with a great and kind heart and I believe that if anyone deserves a miracle it is you. Good things for good people. Forgive any typos this was typed through tears. Oh dear, I am so sorry to hear this. I too have followed your blogs since Sophie Lu and am so very sorry to hear of Willows set back. Take comfort that she is in the best place getting the best care. Prayers for a quick recovery and many happy days ahead for you and Willow. All my prayers go out to your dear Willow! Praying for sweet Willow and for you. Be strong even when your heart is broken. Praying that Willow will make it and come back to you but know this...she knows she is loved. You gave everything you had and I believe our horses and dogs know this. Know also that our Father loves us and hears our prayers. Will be looking for updates and continuing to pray. Oh my gosh... I sure hope they can fix it! I pray for Willow, and for you, your husband and your kids. I am bawling reading this and I feel your pain. We recently rescued a starved and abandoned rottweiler who was near death and nothing but bones.... we nursed her back and loved her silly... she was doing so well... Ond day after 3 months of getting her stronger, we woke to find her seizing and shaking... she didn't make it... her damage too great. Willow CAN heal again ... have faith! I can say nothing to bring you comfort right now except that you are not alone, that Willow is not alone and you have hope....Hope and faith are powerful things. And, you have all of us, here if you just need an ear! I just read this whole blog. I just have no words. What an incredible horse and how wonderful and beautiful for her that she has so many people in her life that want to help and love her. God bless you and your family and all the people caring for her. I will pray that she can survive this and live a good life with you. Your photos are so beautiful. So precious. My heart is just broken for all of you. I first found out about Willow on your facebook page today and came over to read your latest blog. I can't even imagine how you are doing right now. Tears were streaming down my face just reading what happened to Willow and you today. I hope willow got to the vet okay and I hope you can keep us updated no matter what time it is. So many people have come to care for your Willow. Hopefully it's a good thing for Willow to be under-weight right now with her leg. It must be so hard to not be with her right now. I too started following you when you posted the picture of the older horse sitting in the pasture. 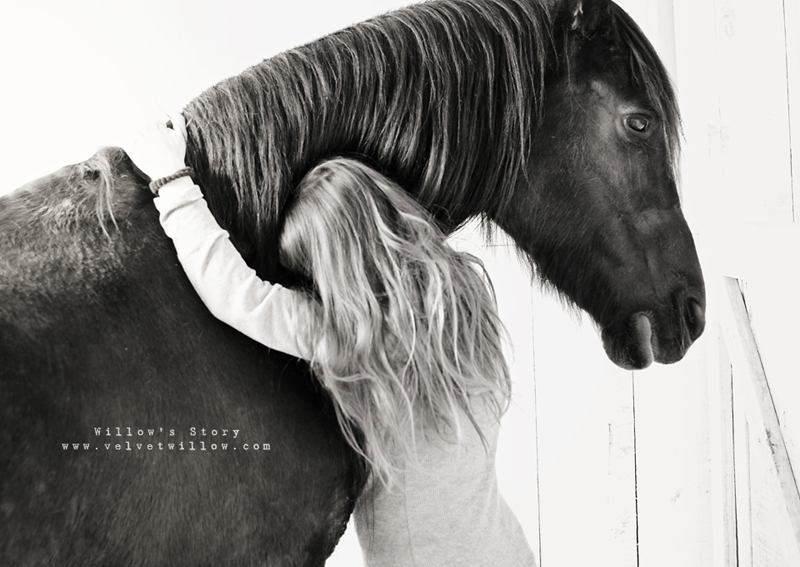 I felt a bond right away with your beautiful and meaningful images and your love of horses. My heart is breaking along with so many others reading this. I am praying for her and have been thinking about you two all day long. No matter what happens take great joy in knowing you love her and she loves and appreciates you. You are a great person and she is a beautiful animal. I will be checking the blog every day. Shana I am praying for you & Willow and her doctors. My heart is breaking for you. Hang in there sweet girl. i am so sorry. saying a prayer and sending a hug. Oh Shana! I can't believe it! :( So sad, and so sorry to hear it! I will be praying for the best possible outcome. I will see her healing. I hope you can get out there to be with her. So so sorry. I am so sorry that this has happened. Along with so many others, I have been entranced with your blog since your first picture of the old, beautiful horse across the way. Your writing and pictures are amazing and your raw emotion makes us feel as if we are right there with you. As I was reading your post a bit ago, while in the middle of making dinner and not paying attention to anyone around me, my husband commented, ” Wow, really babe? Something good?” He was assuming I was on Facebook again. 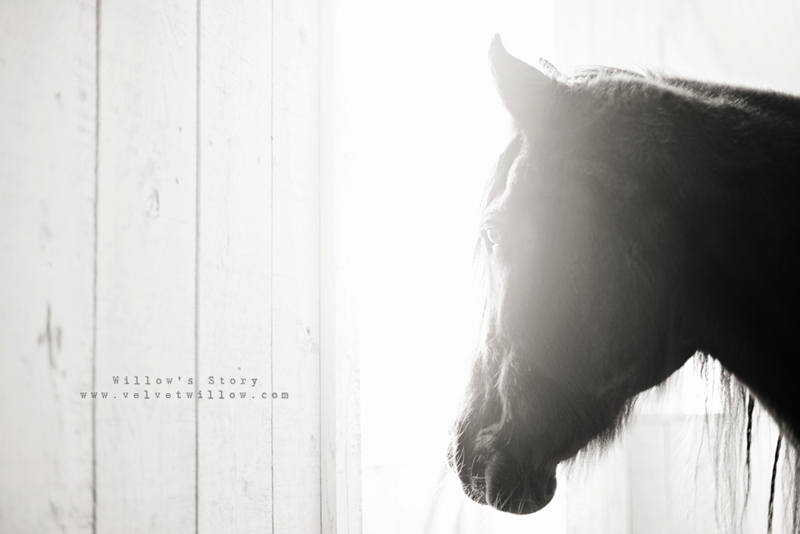 I just replied that I was reading a horse blog-but not just any horse blog and didnt even bother to explain the magical relationship and bond that you have with Willow and all the others and how blessed I, and many others, are to have a little window to look through and see this amazing journey. He just wouldn't get it. My heart breaks for you and I'm so heartsick that you have to go through this. Know that we are all thinking about Willow and sending prayers of healing and positive energy. We are lifting you up so you can be strong for sweet Willow and take comfort in knowing so many around the country are holding the both of you in our hearts and praying for good news. Please please keep us posted on how she is doing, if she arrives safely and what they say. You've shared so much that I feel we all love Willow as much as you. I've cried for her all day, to have over come so much and now this! My heart goes out to you all! Oh Shana...my heart breaks for you. Many prayers for you and sweet Willow. Crying as I read this, but full of hope for Willow to come home to you soon, already on the mend. I can't imagine what you must be going through while you wait for news. Please update us when you can, and know you have support and positive, healing thoughts coming to you from California. Shana, I am praying for you and for Willow! How wonderful it is that she has captured so many hearts through your beautiful pictures and prose, that tonight she has so many prayers with her. Willow has been through so much, it is easy think of her as a frail horse - but the truth is that everything she has been through is proof of what a strong spirit she has. Willow is one tough cookie and I believe that if any horse can pull through this, it's your girl! Sending much love to you tonight, along with encouraging you that while fear and hope naturally go hand in hand - lean towards HOPE, always! I am certainly not a horse person. 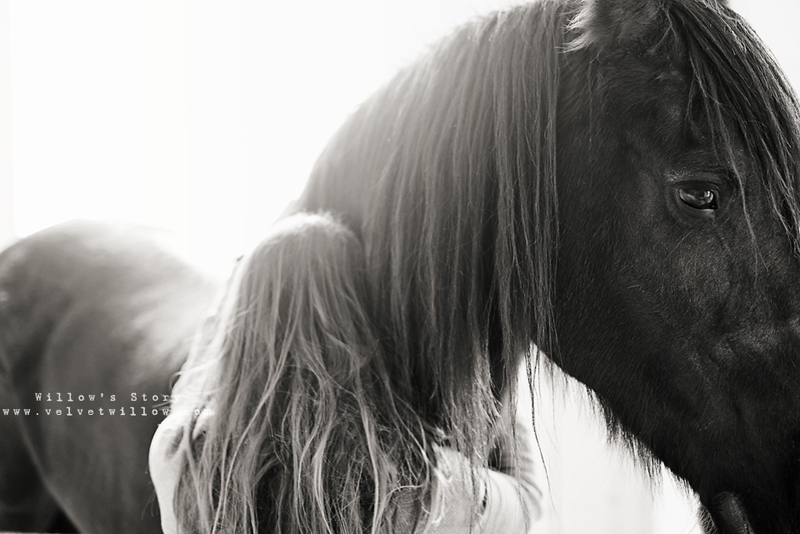 I've never even been near a horse but your stories of Willow have me amazed by your love between each other. I pray you have good news for all of us in the near future. Oh, Shana, I'm devastated to read this. I sincerely hope Willow made the trip okay and that the surgeons can work their magic on your sweet horse. My thoughts are with you and my prayers are going up on your behalf. I am so, so sorry, Shana. I am praying for strength and peace for you and Willow, and for clarity and skill with her medical team. I can't stop crying either. I'm so sorry. May God hold you in his arms and give you peace while you wait. May he guide the surgeons and nurses through this surgery to save your beloved Willow. She has captured all of our hearts and I pray she will be back again with your loving family soon. Take care. Oh sweetie, hate to hear this!!! Sending good thoughts and huge hugs. Please update when you can. so sad to hear about the broken leg. All my thoughts are with you, tear coming from my eyes too..
Everything will be ok. You and Willow deserve the best. Anxiously awaiting news, sitting here crying in my coffee this morning reading your post. Yours and Willows story has captured my heart from the beginning, andi just know that story is NOT over. R&R is the best...if anyone can do it they can! I bawled my eyes out reading your pain. Our four-legged babies are many times so much more special than a lot of the two-legged people in our lives. Praying for nothing but a great outcome for this special girl. Your photos are so touching and beautiful even through your worry and pain. So full of expression and concern, but most of all true love from you and trust from her. She knows you're trying to help her and will do everything you can. Hello, I am so sorry about that :-(((( I keep my fingers cross for you two. This is so sad, it makes my cry. I hope Willow is gonna be ok. I will check your blog for new. Be strong! wow, that's harsh. I really hope that surgery is successful and she will be well again! I think she is trying to tell you something though. She is not in your life to be ridden. there are many things you can do with a horse that don't involve sitting on it. if it works out, great. but don't count on it. all the best for you and your sweet Willow..
Oh Shana, how heart-wrenching. She will be ok. This story is amazing. Your blog is holding a bestseller, a movie. Shana, I am just catching up on your blog posts and this post was so sad as you first encountered her injury. So Beautiful the two of you are, together.